If a wheelchair isn’t a part of your daily life, it’s almost impossible to truly understand the challenges that wheelchair users face on a daily basis. Of course, accessibility is always a primary concern. But so is interacting with people who aren’t quite sure how to help wheelchair users. Because the team at AMS Vans is a tireless advocate for true mobility freedom, today’s blog is a primer on a few critical accessibility issues: proper wheelchair etiquette, how to help wheelchair users in your life, and what not to say to a wheelchair user. We hope that you’ll consider these ideas and practice conscious respect in an attempt to strengthen your relationships and improve the lives of those around you. And, if you have any additional suggestions on how to help wheelchair users that we miss or reactions to the topics we cover, please help our readers know more by leaving them in the comments section below. Learning wheelchair etiquette helps create and maintain solid relationships. No matter what kind of person the wheelchair user you know happens to be — a senior citizen, a young adult, a young child — most will tell you that, while they appreciate your desire to help, they have a burning desire to be treated just like any able-bodied person. So, here’s what to keep in mind with respect to wheelchair etiquette when considering how to help wheelchair users. 1. Don’t assume the wheelchair user’s physical condition. People require wheelchair assistance for a variety of reasons — temporary injury, permanent disability, support in older age, etc. — so refrain from assuming any one cause. 2. Greet the wheelchair user like you would any other acquaintance. That means extending your hand for a firm handshake, bending down to give them a hug if the relationship warrants, and always looking them in the eye — in other words, pretty much how you would typically greet anyone you meet. 3. There’s typically no need to refer to the wheelchair. Aside from obvious exceptions, there’s no reason to ever mention the wheelchair in conversation (unless you’re considering buying one for someone you know) — because the wheelchair is simply a tool utilized to help that person live a fuller life. 4. Do not touch the person’s wheelchair — unless asked to. Because wheelchair users are at a lower height, a pat on the back can be inadvertently condescending — and there’s typically never a reason to touch the wheelchair unless you’ve been specifically asked to help maneuver it. 5. Be aware of accessible ramps and other adaptable conveniences. As you walk along with the wheelchair user, be cognizant of wheelchair ramps and accessible entrance ways — make those adaptable tools a natural part of your route into and out of a facility for the sake of the wheelchair user. These small thoughts and acts of kindness can make a world of difference for your family member, friend, workmate, or colleague. Plus, the more you help wheelchair users, the more natural they become in your everyday interactions with wheelchair users. So, you want to help wheelchair users at the top (or bottom) of a flight of stairs. Or maybe, they’re trying to get into the front door of your office building. No matter what the situation might be, you’d really like to help out — but you just don’t know how. And, you’re not even sure if they want your help at all. Here are some tips to keep in mind. Step #1: Determine if the wheelchair user needs your help. Ask if and how you can help. Look the wheelchair user in the eye and speak directly to them — never through a third person. Always inform the wheelchair user of your intentions before you touch their wheelchair. Step #2: Navigating curbs and stairs. If you’re going up, turn the wheelchair backwards to approach the obstacle. Grip the handles firmly and back the wheelchair to the step. Lean back to take the weight of the chair, find your balance, and gently pull. If you’re going down, approach with the wheelchair facing forward and repeat the same movement. Step #3: Navigating a hill or steep grade. Make sure the path of travel is clear and grip the handles firmly. Take one step backwards (going down) or forwards (going up) at a time. Control the wheelchair speed and turning movements to avoid losing control. Step #4: Loading/unloading the wheelchair. To pack most wheelchairs, remove the cushion, adjust the footrest by rotating them out or removing them, hold seat midpoint at the front and back and gently pull upwards. To unpack most wheelchairs, keep your fingers inward and push down on both sides of the seat, but never force open the chair and never put your fingers between the frame to prevent injury. If you try to help wheelchair users and your assistance is truly welcome, these small gestures can go a long way in enhancing their mobility freedom by saving them valuable energy and preventing possible injury. Wheelchair life can be made easier with some basic adaptations. If you’re not accustomed to conversing with a wheelchair user, you might not realize that some of the things you say may be inconsiderate, at best — and downright rude, at worst. Often, well-meaning jokes and intended pleasantries can wind up hurting the feelings of a wheelchair user. Here are a few things you should avoid saying. 1. ‘Please, don’t run me over.’ Often said with a wry smile and accompanied by a dramatic step out of the path of a still wheelchair. Just because the person is in a wheelchair, that doesn’t mean they are predisposed to a desire to cause you injury — although they might want to after they hear you make that statement, even jokingly. 2. ‘I’m glad people like you are able to get out.’ This well-meaning statement insinuates that wheelchair users typically don’t do anything with their lives. Also, it implies that the person does not really belong in the environment in which you both happen to be — which is not only untrue, but also inexcusably rude. 3. ‘Do you have a license to operate those wheels?’ Again, probably said with humorous intent. However, this unoriginal ‘joke’ makes light of the wheelchair. And, even though the wheelchair user might laugh, rest assured that they almost never find this funny — unless they’re a child, and even then probably not. 4. ‘Are you alone? Is anyone here with you?’ Believe it or not, wheelchair users are adults who can go places by themselves and take care of themselves. They don’t need escorts, babysitters, or minders to help them to navigate the world. Plus, these groceries aren’t going to shop themselves. 5. ‘What happened to you?’ This statement is typically meant as small talk, but actually requests personal information that the wheelchair user might not want to divulge. Even if you’re dying to know, the only respectful way to find out what caused them to need a wheelchair is to befriend them and wait for them to bring it up. Period. So, just like with any other relationship you have, it’s always best to think about what you say before the words come out of your mouth. This is especially true as you attempt to help wheelchair users. Therefore, a little mental editing could help save your wheelchair-using friend — and yourself — a great deal of embarrassment and regret. Wheelchair users rely on various mobility equipment aids to enhance living. So, the greatest lesson you can take from these ideas as you try to help wheelchair users is to always operate from a place of respect. Wheelchair users appreciate kindness and thoughtfulness just like everyone else — as long as your words and actions recognize them as capable, independent people. And, like anything else in life, practice makes perfect. Look for ways to offer support and encouragement to your wheelchair-using family member, friend, workmate, or colleague. Chances are that your efforts will help wheelchair users, establish strong relationships and enhance the lives involved — both yours and theirs. 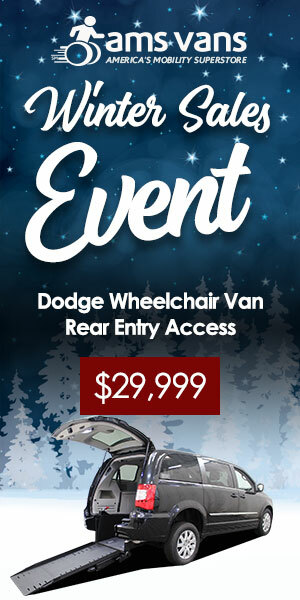 AMS Vans boasts a robust inventory of accessible vans to help wheelchair users achieve true mobility freedom. You’ll love shopping our 24/7/365 virtual showroom — online and from the comfort of your own home — and browsing a wide selection of quality, affordable vehicles backed by a 134-point inspection and a solid warranty. This entry was posted in In the News, Wheelchair Accessibility on October 17, 2017 by AMSVans.